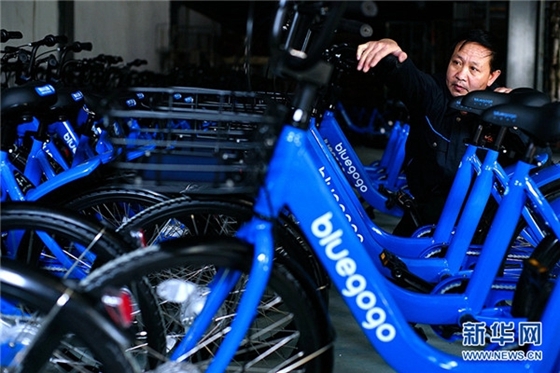 With China's third-largest bike-sharing start-up Bluegogo now going bankrupt, the company's clients are finding it difficult to retrieve their deposits, reports the Beijing Times. In announcing the failure of his company, Bluegogo founder Li Gang has failed to explain how he plans to refund deposits to users, repay wages owed to employees and money owed to other service providers, which is reportedly upward of 200 million yuan. This has once again opened up debate about what should be done to protect consumer interests in the bike-sharing sector, particularly the deposits clients have to set down to use the service originally. A phenomenon which exploded throughout China the past couple of years, the bike-sharing industry has undergone a wave of reshuffling this year, as various companies have shut down due to funding problems or poor management, including Chongqing-based Wukong Bike, Beijing-based 3Vbike and Coolqi bike. The uncertainty about the stability of these start-ups prompted Chinese authorities in August to issue a new set of regulations for the deposits collected to ensure people can get their money back, including establishing a special account for the money. However, reports suggest many of these bike-sharing start-ups seem unwilling, or unable, to provide refunds now. Customers of either failed or struggling bike shares are reporting waiting for up to 2 months to get their money back. In its latest announcement on Wechat, Coolqi says it has stopped its refund services in Beijing, and is now requiring users to show up, in person at an office in Chengdu, Sichuan province, to recover their refund. "Coolqi's move is unreasonable and is setting obstacles for consumers to recover their deposits," Qiu Baochang, a legal consultant of the China Consumers' Association, told journalists from the Beijing News. When many of the bike sharing services broke into the market, they promised customers their deposits, which range between 100 to 300 yuan per person, would not be touched by the companies, but would simply be used as a guarantee to ensure you properly use and return their product. However, in February, Hu Yufei, Vice-CEO of Bluegogo, was quoted as admitting his company did use part of the users' deposits as part of the company's operational budgeting. This has led to accusations of shady accounting and business practices among many of the bike sharing start-ups.